Featuring a handy Stuff Sac, to pack the Bikeparka away, by literally stuffing it into the bag, you don’t even need to be tidy. You can even attach to your bike frame using the eyelets when you’re out and about. 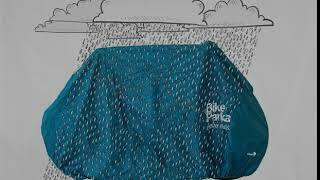 The Stash Cycle Cover is perfect day to day use around the home, when you’re not using your bike. Open: Simply put the cover under the front wheel and pull it back over your bike. You can then adjust the toggle on top to take up extra slack left or right. Cleaning - Sponge clean with warm water and a natural soap/ mild detergent. And don’t machine wash or tumble dry.